All the conversations about ‘are the knives out?’ and ‘are people plotting?’ . . . the fact is I’m the premier until either the people decide I’m not the premier or I decide I’m going to step down. That’s how it works. No, Premier, that’s not how Responsible Government works. And that’s not how prime ministerial succession works either. Perhaps if Eugene Forsey were still alive, he could add Wynne’s statement to his “25 Fairy Tales About Parliamentary Government” as the 26th entry. Of the core Commonwealth Realms, only in Canada could a party leader get away with such a baseless and brazen declaration — despite some recent examples to the contrary. In particular, a prime minister or premier in Australia would never utter such a falsehood, because it could dare the parliamentary party to orchestrate an ad hoc leadership election. 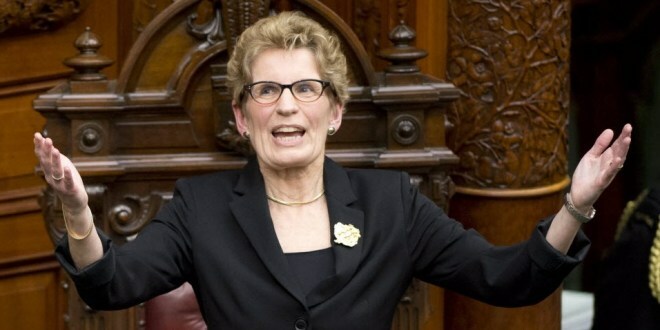 Wynne asserts that only “the people decide” or “[she] decide[s]” when she must resign as Premier, by which she probably has in mind general elections that yield majority parliaments, which see an uneventful transition of power from one party to another, and to intra-parliamentary transitions of power that occur when the leader of the governing party and premier resigns and the new leader of the governing party succeeds as premier. In any event, it is not “the people” who determine whether Wynne will remain as Premier, but rather, the people’s elected representatives. Her ignorance is all the more extraordinary given that she first became premier in a minority parliament on 11 February 2013 and that she advised the dissolution of that legislature on 2 May 2014, in anticipation that she would lose a vote on confidence on budget later that week. In reality, Premiers can lose power in various other ways. In a minority parliament, the government could lose a vote of confidence, and, if an alternate government could be formed within that parliament, then the governor could refuse the premier’s request to dissolve the assembly and instead appoint a new premier — though this is unlikely. What is more likely is that the parliamentary party could within a majority parliament decide to replace its own party leader, and, consequently, the premier as well. Wynne should remain mindful of this possibility, given that this fate has recently befallen two Canadian premiers: Premier Dunderdale of Newfoundland was ousted by her own parliamentary party in January 2014, and Premier Redford in Alberta suffered this same fate in March 2014. By Canadian standards, these coups were swift and brutal: Redford announced her resignation on 19 March 2014, and it went into effect on 23 March 2014; Dunderdale announced her intent to resign as party leader and premier on 22 January 2014 and made her resignation effective the following day. In both cases, the PC Party of Newfoundland and Labrador and the PC Party of Alberta both opted to appoint “interim leaders” who, by virtue of their parties’ respective parliamentary majorities, the Lieutenant Governors were obliged to appoint as Premiers as well. In this respect, Canadian political parties differ from Australian political parties. In Australia, parties both oust leaders and elect leaders. But since all Canadian political parties, according to their respective party constitutions, elect their leaders through either delegated conventions or direct vote of party members, and since this process generally takes several months, the parliamentary parties must nominate interim leaders who will lead the party and their own quasi-caretaker government during this time. In Canada, parliamentary parties do occasionally oust their leaders, but they never elect anything more than interim leaders. If Wynne is not careful, the parliamentary party and cabinet could very well decide that she will follow in the footsteps of Dunderdale, Redford, and Chretien. Wynne also alluded to Pierre Trudeau’s proverbial “walk in the snow” of 1984 for the benefit of Canadian politicos. Wynne has this extraordinary ability to make statements which sound superficially reasonable, but which are in fact very presumptuous and even a bit mendacious. Wynne should not merely feel responsibility for her policies; in fact, she is responsible for them in every constitutional, legal, moral, ethical, factual, and practical sense. Our system of government necessarily means that Cabinet is collectively responsible for every policy that it puts forth. And both the principles of responsible party government and recent political experience over the last three years show that the Cabinet and parliamentary party both wield significant power and determine whether a party leader and premier can continue in those roles. But for whatever reason, the media and the academy are quite content in letting Ontarians forget it. Will Wynne Pull a Harper? This entry was posted in Crown (Powers and Office), Formation of Governments, Succession (Prime Minister). Bookmark the permalink.